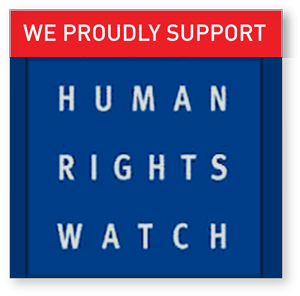 Home » World News » Europe » IRAQ: Chilcot Report – Blair Told Bush, I Will Be With You, Whatever. IRAQ: Chilcot Report – Blair Told Bush, I Will Be With You, Whatever. Originally published (July 6, 2016). The Guardian. Photos and Video Added. 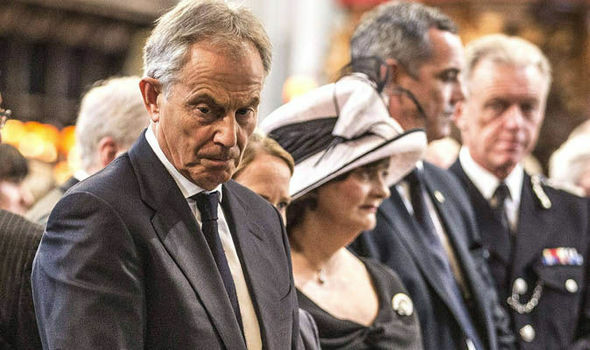 Looking tired, his voice sometimes croaking with emotion, Blair described his decision to join the US attack as “the hardest, most momentous, most agonising decision I took in 10 years as British prime minister”. He said he felt “deeply and sincerely … the grief and suffering of those who lost ones they loved in Iraq”. “There will not be a day when I do not relive and rethink what happened,” he added. But asked whether invading Iraq was a mistake Blair was strikingly unrepentant. “I believe we made the right decision and the world is better and safer,” he declared. He argued that he had acted in good faith, based on intelligence at the time which said that Iraq’s president had weapons of mass destruction. This “turned out to be wrong”. k in 2009 – shot down long-standing claims that he had lied about the war to the British publicand cynically manipulated intelligence. Where there had been mistakes they were minor ones involving “planning and process”, he said. He said he “couldn’t accept” criticism that British soldiers died in vain. Blair’s extraordinary two-hour press conference came after Chilcot, a retired civil servant, published his long-awaited report into the Iraq debacle. In the end, and seven years after hearings first began, it was a more far-reaching and damning document than many had expected. It eviscerated Blair’s style of government and decision-making. The head of the Iraq war inquiry said the UK’s decision to attack and occupy a sovereign state for the first time since the second world war was a decision of “utmost gravity”. Chilcot described Saddam as “undoubtedly a brutal dictator” who had repressed and murdered many of his own people and attacked his neighbours. The report also bitterly criticised the way in which Blair made the case for Britain to go to war. 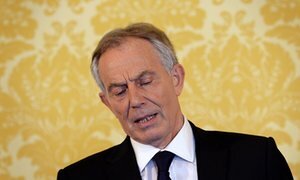 It said the notorious dossier presented in September 2002 by Blair to the House of Commons did not support his claim that Iraq had a growing programme of chemical and biological weapons. The then Labour government also failed to anticipate the war’s disastrous consequences, the report said. 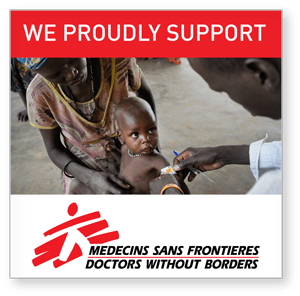 They included the deaths of “at least 150,000 Iraqis – and probably many more – most of them civilians” and “more than a million people displaced”. “The people of Iraq have suffered greatly,” Chilcot said. Chilcot did not pass judgment on whether the war was legal. But the report said the way the legal basis was dealt with before the 20 March invasion was far from satisfactory. The attorney general, Peter Goldsmith, should have given written advice to cabinet and ministers – one of few findings that Blair accepted on Wednesday. Lord Goldsmith told Blair that war without a second UN resolution would be illegal, only to change his mind after a trip to Washington in March 2003 and meetings with Bush administration legal officials. Overall, Chilcot’s report amounts to arguably the most scathing official verdict on any modern British prime minister. It implicitly lumps Blair in the same category as Anthony Eden, who invaded Egypt in a failed attempt to gain control of the Suez canal. 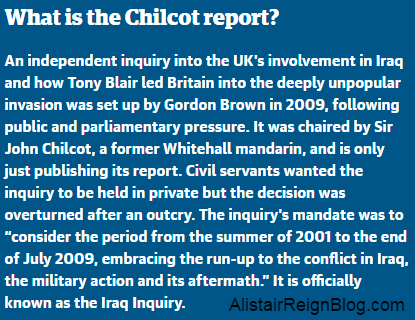 Chilcot’s 2.6m-word, 12-volume report was released on Wednesday morning, together with a 145-page executive summary. The venue was the Queen Elizabeth II conference centre in Westminster. As families of service personnel killed in Iraq welcomed its strong contents, anti-war protesters kept up a raucous chorus of “Blair Liar”. • There was no imminent threat from Saddam Hussein. • The strategy of containment could have been adopted and continued for some time. 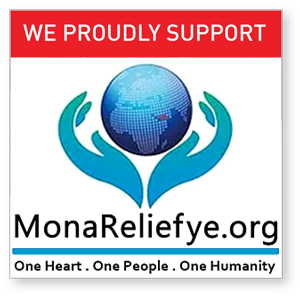 • The judgments about the severity of the threat posed by Iraq’s weapons of mass destruction – WMDs – were presented with a certainty that was not justified. • Despite explicit warnings, the consequences of the invasion were underestimated. The planning and preparations for Iraq after Saddam were wholly inadequate. • The widespread perception that the September 2002 dossier distorted intelligence produced a “damaging legacy”, undermining trust and confidence in politicians. The Labour leader, Jeremy Corbyn, apologised for his party’s “disastrous decision to go to war”, calling it the most serious foreign policy calamity of the last 60 years. Jack Straw, the foreign secretary at the time, and who largely escaped Chilcot censure, said that Blair was never “gung ho” about war.Other allies also came to Blair’s defence. Alastair Campbell, his former press secretary, said Blair had not given Bush a blank cheque. There were no easy decisions, Campbell added. In a statement on Wednesday Bush acknowledged mistakes but said he continued to believe “the world is better off without Saddam in power”. The report, however, disagrees. It sheds fresh light on the private discussions between Blair and Bush in the run-up to war. The report says that after the 9/11 attacks Blair urged Bush “not to take hasty action on Iraq”. The UK’s formal policy was to contain Saddam’s regime. But by the time the two leaders met in April 2002 at Bush’s ranch in Crawford, Texas, the UK’s thinking had undergone “a profound change”. The joint intelligence committee had concluded that Saddam could not be removed “without an invasion”, with the government saying Iraq was a threat “that had to be dealt with”. At times, Blair’s notes read more like stream of consciousness than considered policy documents. The note continued: “He [Saddam] is a potential threat. He could be contained. But containment … is always risky.” It says “we must have a workable military plan” and proposes a “huge force” to seize Baghdad. Asked what “whatever” meant, Blair said on Wednesday his support for Bush was never unconditional or unqualified. He said that he had persuaded the US president to go down the “UN route”. 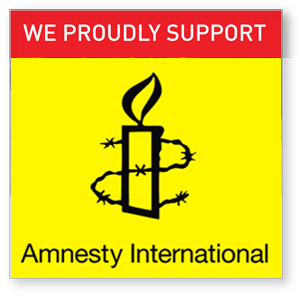 Blair also linked his actions in Iraq with the ongoing global struggle against Islamist terrorism. The Iraq war inquiry has left the door open for Tony Blair to be prosecuted. According to Chilcot, however, Blair shaped his diplomatic strategy around a “military timetable” and the need to get rid of Saddam. He told Bush in his note this was the “right thing to do”. Blair suggested that the simplest way to come up with a casus belli was to give an ultimatum to Iraq to disarm, preferably backed by UN authority. 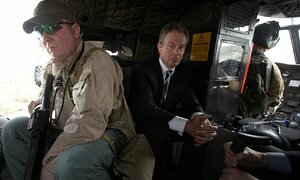 Chilcot rejected Blair’s view that spurning the US-led military alliance against Iraq would have done major damage to London’s relations with Washington. “It’s questionable it would have broken the partnership,” he writes, noting that the two sides had taken different views on other major issues including the Suez crisis, the Vietnam war and the Falklands. The report said that by January 2003 Blair had concluded “the likelihood was war”. He accepted a US military timetable for action by mid-March, while at the same time publicly blaming France for failing to support a second UN resolution in the security council authorising military action. Chilcot was again unimpressed. “In the absence of a majority in support of military action, we consider that the UK was, in fact, undermining the security council’s authority,” he said. The report also demolished Blair’s claim made when he gave evidence to the inquiry in 2010 that the difficulties encountered by British forces in post-invasion Iraq could not have been known in advance. Tony Blair at the July 7th anniversary service. The report is critical of the Ministry of Defence and military commanders who were tasked with occupying four southern provinces of Iraq once Saddam had been toppled. “The scale of the UK effort in post-conflict Iraq never matched the scale of the challenge,” Chilcot said, noting that security in Baghdad and south-east Iraq deteriorated soon after the invasion. In the end, 179 British service personnel died before UK forces pulled out in 2009. Chilcot said the MoD was “slow in responding to the threat from improvised explosive devices”. He said that delays in providing properly armoured patrol vehicles “should not have been tolerated”. Nor was it clear which official was in charge. “It should have been,” Chilcot said. As part of his remit, Chilcot also set out what lessons could be learned. He said that Blair “overestimated his ability to influence US decisions on Iraq”. The Guardian: Tony Blair unrepentant as Chilcot gives crushing Iraq war verdict.